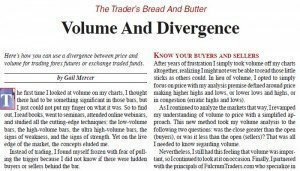 Gail Mercer, Founder of TradersHelpDesk, offers many day trading articles free on volume and price analysis, as well as market analysis. Her day trading articles have been published in Stocks & Commodities magazine plus Traders World Online Expo books. Gail has also been a speaker at the Wyckoff Conference in Floriday, TradeStation User Groups, as well as Traders Expo. Gail is a recognized expert in volume and price analysis and she teaches you the basics in her day trading articles free. Gail is also an avid follower of Richard Wyckoff and her take on his volume analysis method follows his methodology. To request your free articles volume and price analysis, simply subscribe to our mailing list and we will send the articles!